I've divided this section into two parts-pressure operated automatic pool cleaner problems and vacuum pool cleaner problems. I do not cover every problem,but the easier problems that can be fixed by homeowner. You can also contact me for additional help. 1)The number one problem I can think of is a dirty finger screen as shown in the photo below. Its called a finger screen because the original pressure side cleaner,the Arneson Pool Sweep,had a screen about the size/length of a finger. The screen is sometimes inside a pool wall fitting,on the return plumbing,or attached to the wall fitting by a plastic housing-sometimes this housing is transparent so you can see when the screen is full of debris. The Hayward Viper has its finger screen in the head of the unit at the end of the feed hose. The number one reason it gets dirty is debris from filter right after backwashing or cleaning the filter. Also,if you have holes in your D.E. 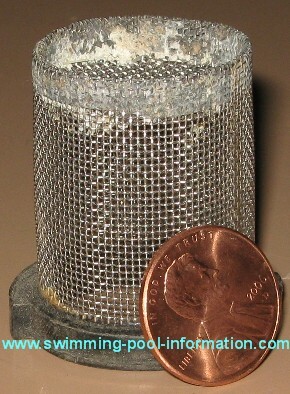 filter grids or defective o-rings or seals in your filter or backwash valve the screen can get clogged. If you see bits of plastic in the screen,you may have a damaged booster pump from running dry. 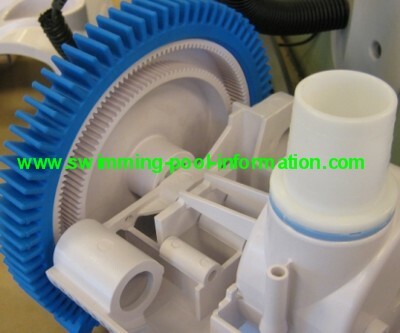 3)If you have an automatic pool cleaner like the unit shown on the left or right below,you may need to replace the drive belts if it is not moving/moving very slowly. 4)Some cleaners are driven with gears-such as the unit above ...as these wear out,the unit will slow down also. You can tell on these units if you have gears or belts by looking at the wheels-the geared models have teeth. 5)As the hose and hose fittings get older,they leak more and the loss of water pressure can slow down your unit. 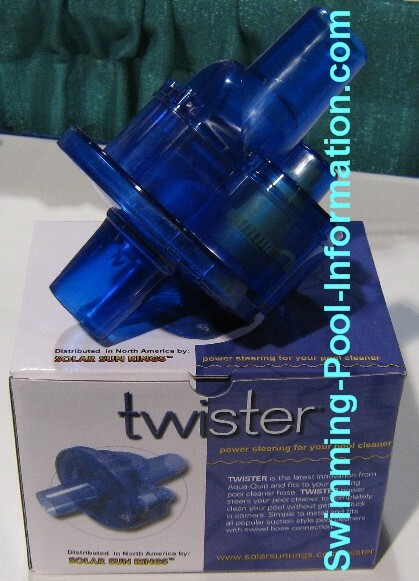 You can buy a whole hose kit or just the individual hoses and/or swivel connectors. 1)Some pressure side cleaners such as the Polaris or Legend have an attached float which balances the unit....as these floats get older,they develop cracks which let water in and cause the unit to fall on its side. 1)The tail jet adjustment screw must be turned clockwise to lower amount of water going to tail jet. 2)In winter,tail hoses get stiffer in colder water so they do not bend as easily and squirt water out of pool more often...same goes for older hoses. 3)Polaris makes a tail weight kit to keep tail down but still keep the pressure up to get good sweeping action. These weights will also work on other cleaner's tails. 1)The number one vacuum automatic pool cleaner problem is lack of suction,which could be a small animal such as a rat,gopher,or rabbit and/or debris may be stuck in suction opening. 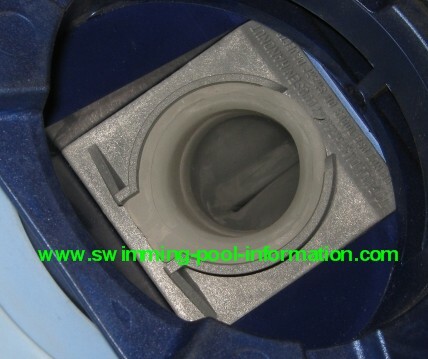 2)If you have a dedicated line for suction cleaner(and another line for pool skimmer suction),the valve may be turned 100% to pool skimmer. 4)Some suction cleaners such as the Baracuda have a latex-like diaphragm in the throat(shown in the photo below) that must be replaced when it develops holes-the unit will come to a dead stop. 2)If you have a suction cleaner that is run by geared program(it goes straight for a certain amount of time,then left,then right,etc.) the gears sometimes get small pieces of debris caught in them which can cause your cleaner to get stuck such as on a step. 3)Dirty filter and/or pump basket? 4)Many automatic pool vacuums have replaceable footpads that can cause cleaner to slow down or get stuck as they wear out. 1)Are the four footpads worn down? 2)Hayward navigators or pool vacs have two pods (where footpads are connected to) on the bottom of the head...if these pods get loose,the cleaner will not move,or move very slowly. Just tighten one screw on each side covered by a plastic cap. 3)Attached to the pods inside the head are two "A" frames which have two ball bearing wheels on the top which ride a turbine...these wheels wear out after time,causing sluggish performance. 4)A pool service tech in Arizona told me that the bottom suction plate of the Navigator has two offsets which help guide the flow into the head of unit - if these get worn down over time,the head will stick to the bottom of pool or main drain. 1)Many suction cleaners such as Kreepy Krauly and Baracuda have floats which balance the unit...these may become water logged. 2)Some cleaners have gears which can get stuck causing the cleaner to always turn the same direction and go over on its side.